Adelaide Zoo is a zoo located in Adelaide, South Australia, Australia. This photo was sent in by BJ. He writes: "I recently visited Adelaide Zoo in South Australia and found a great urinal which would be good to add to the collection. It is located within an aviary building and when using the urinal you can see and hear the birds flying around. The zoo itself is quite engaging with progressive enclosures, often using natural boundaries like moats rather than cages and feature a pair of Pandas which are part of a regional breeding program. 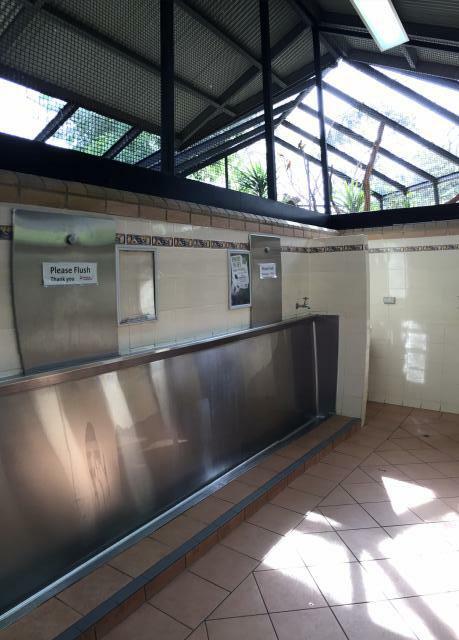 The long, stainless steel back wall and ground trough style urinal is common in high use venues in Australia & New Zealand."